Acta Pharmaceutica Sciencia is a continuation of the former "Eczacılık Bülteni" which was first published in 1953 by Prof. Dr. Kasım Cemal GÜVEN’s editorship. At that time, “Eczacılık Bülteni” hosted scientific papers from School of Medicine-Pharmacy Branch, Istanbul University, Turkey. Since 2006, the journal has been publishing only in English with the name, “Acta Pharmaceutica Sciencia” that represents internationally excepted high level scientific standards. The journal has been publishing quarterly per year except an interval from 2002 to 2009 which released its issues trimestral in a year. Publication was discontinued from the end of 2011. 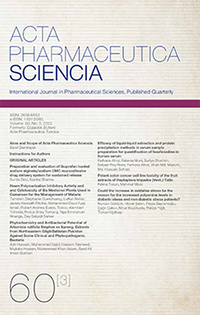 With this latest published issue in 2016, Acta Pharmaceutica Sciencia will continue publication with the reestablished Editorial Board and also with support of you as precious scientists.